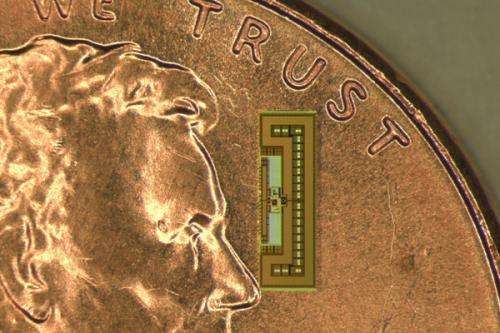 The tiny radio-on-a-chip gathers all the power it needs from the same electromagnetic waves that carry signals to its receiving antenna. (Phys.org) —A Stanford engineering team has built a radio the size of an ant, a device so energy efficient that it gathers all the power it needs from the same electromagnetic waves that carry signals to its receiving antenna – no batteries required. Designed to compute, execute and relay commands, this tiny wireless chip costs pennies to fabricate – making it cheap enough to become the missing link between the Internet as we know it and the linked-together smart gadgets envisioned in the "Internet of Things." "The next exponential growth in connectivity will be connecting objects together and giving us remote control through the web," said Amin Arbabian, an assistant professor of electrical engineering who recently demonstrated this ant-sized radio chip at the VLSI Technology and Circuits Symposium in Hawaii. Much of the infrastructure needed to enable us to control sensors and devices remotely already exists: We have the Internet to carry commands around the globe, and computers and smartphones to issue the commands. What's missing is a wireless controller cheap enough to so that it can be installed on any gadget anywhere. "How do you put a bi-directional wireless control system on every lightbulb?" Arbabian said. "By putting all the essential elements of a radio on a single chip that costs pennies to make." Cost is critical because, as Arbabian observed, "We're ultimately talking about connecting trillions of devices." Arbabian began the project in 2011 while he was completing a PhD program and working with Professor Ali Niknejad, director of the Wireless Research Center at the University of California, Berkeley. Arbabian's principal collaborator was his wife, Maryam Tabesh, then also a student in Niknejad's lab and now a Google engineer. Amin Arbabian, assistant professor of electrical engineering, talks about the ant-sized radio. Arbabian joined the Stanford faculty in 2012 and brought a fourth person onto the team, Mustafa Rangwala, who was then a postgraduate student but is now with a startup company. The work took time because Arbabian wanted to rethink radio technology from scratch. "In the past when people thought about miniaturizing radios, they thought about it in terms of shrinking the size of the components," he said. But Arbabian's approach to dramatically reducing size and cost was different. Everything hinged on squeezing all the electronics found in, say, the typical Bluetooth device down into a single, ant-sized silicon chip. This approach to miniaturization would have another benefit – dramatically reducing power consumption, because a single chip draws so much less power than conventional radios. In fact, if Arbabian's radio chip needed a battery – which it does not – a single AAA contains enough power to run it for more than a century. But to build this tiny device every function in the radio had to be reengineered. The antenna had to be small, one-tenth the size of a Wi-Fi antenna, and operate at the incredibly fast rate of 24 billion cycles per second. Standard transistors could not easily process signals that oscillate that fast. So his team had to improve basic circuit and electronic design. Many other such tweaks were needed but in the end Arbabian managed to put all the necessary components on one chip: a receiving antenna that also scavenges energy from incoming electromagnetic waves; a transmitting antenna to broadcast replies and relay signals over short distances; and a central processor to interpret and execute instructions. No external components or power are needed. And this ant-sized radio can be made for pennies. Based on his designs, the French semiconductor manufacturer STMicroelectronics fabricated 100 of these radios-on-a-chip. Arbabian has used these prototypes to prove that the devices work; they can receive signals, harvest energy from incoming radio signals and carry out commands and relay instructions. Now Arbabian envisions networks of these radio chips deployed every meter or so throughout a house (they would have to be set close to one another because high-frequency signals don't travel far). He thinks this technology can provide the web of connectivity and control between the global Internet and smart household devices. "Cheap, tiny, self-powered radio controllers are an essential requirement for the Internet of Things," said Arbabian, who has created a web page to share some ideas on what he calls battery-less radios. I'm very curious to see where this technology goes. The novelty of knowing you can just stick it wherever you need it to go without a power source is almost magical. The barometer of success for interconnected transmitters at 24 billion cycles per second will be irradiating men's scrotums with 24 billion cycles per second, effectively microwaving men's balls, sterilizing the population with free WIFI & bith control. Gawd, we are so screwed. They can be dropped from the sky, in vast numbers. They will not be used to promote human dignity and privacy. Damn, that's *awfully* close to the "localizers" used in Vernor Vinge's "A Deepness In The Sky" (one of the best science fiction novels of all time by the way). More specs on bandwidth and computing capability would be useful. Per Shannon, the information carrying capacity of the communication links is influenced by the dynamic range of the channels. Given the low power of the transmitters, probably pretty limited for these devices. Re scrotum angst: tissue penetration at 24 GHz is low. Much lower still at 60 GHz. Mix them in with the paint on your walls? Erm. You do know what power levels we're talking about, here? That's sort of the downside. With the appropriate receiving device you could gather all the information in a nearby apartment/house. So I'd rather we think about appropriate uses (and encryption/security) first before just sticking this stuff on everything. Never fear my fellow Americans. These invading unwelcome vermin operate on very low powered RF waves. How long would it take for one of you smart guys to build a handheld very powerful but short range EMP burst sweeper? Walk into your house sweep over every square foot and fry them all in seconds. While you are at it go ahead and smash all the cameras on your smart devices so the Goobermunt cant spy on you. @sinister - NOTHING is safe and secure from being hacked if it has any form of input. Light switches are too reliable to be replaced by any electronic device. Who's been happy with computers in cars? Nobody! They cost too much, break too often, and are expensive to repair. Give me a non-computerized car anytime. It'll be the same with computerized light switches and refrigerators in houses. If it ain't broke, don't fix it.